The calvingGiving birth to a calf. period has a significant impact on the cow’s future fertilityAbility of a living organism to reproduce. From a zootechnical point of view: ability to give birth to a calf, a lamb, a goat or a piglet.. Any interference during the calvingGiving birth to a calf. process such as a difficult calvingGiving birth to a calf., retained placenta, etc will most likely cause delays in the return to cyclicityCharacterizes what is cyclical: returns to regular intervals and is repeated in a cycle. Return to cyclicity is highly important in the post-partum phase..
Trauma of the genital tract and conditions of hygiene during calvingGiving birth to a calf. Delayed involutionSpontaneous or induced decrease of a tissue, organ or tumour. Particular method of evolution of an organ in which its initial appearance is restored e.g. involution of the uterus after parturition. MetritisInflammation of various tissues of the uterus, mainly of the uterine lining (endometritis), but also of the uterine muscle (myometritis or cervicitis). Causes of puerperal metritisInflammation of various tissues of the uterus, mainly of the uterine lining (endometritis), but also of the uterine muscle (myometritis or cervicitis). Difficult calvingGiving birth to a calf..
Twin calvingGiving birth to a calf. What is the effect of uterine pathology on the calvingGiving birth to a calf.-to-conception interval? Is there any influence of the calvingGiving birth to a calf. difficulty on the reproductive cycle before synchronisationTwo or more events that occur at the same time or in a precise coordinate succession: oestrus synchronization allows an organised and grouped artificial insemination. treatment and on the rate of induced ovulationExpulsion of an ovum from the ovary in female animals. in beef cows? 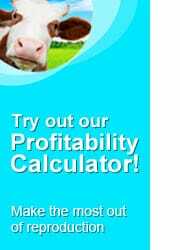 Do body condition score and calvingGiving birth to a calf. 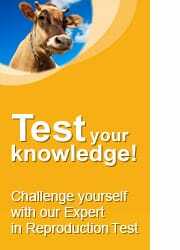 difficulty have an influence on the pregnancy rate in beef cows? What is the relationship between the ease of calvingGiving birth to a calf., metritisInflammation of various tissues of the uterus, mainly of the uterine lining (endometritis), but also of the uterine muscle (myometritis or cervicitis). and fertilityAbility of a living organism to reproduce. From a zootechnical point of view: ability to give birth to a calf, a lamb, a goat or a piglet. ?